Frieze of Chan Chan, Trujillo. Photo: Mylene d'Auriol Stoessel. Machu Picchu Luxury Tours. The land price includes escorted transfers, private excursions with professional guides and chauffeurs, entrance fees, selected category of accommodations, gourmet cuisine, all land and water transportation, and travel insurance for guests through the age of 59 years (over that age, there is a supplementary fee). All prices are per person based on two people sharing a guest room. For a detailed description of our services, see Opulent Itineraries. Mochica "huaco" depicting a "soldier" duck, Pyramid of the Moon, Trujillo. Museo Nacional de Arqueologia, Antropologia e Historia del Peru. The north coast of Peru features spectacular contrasts between fertile valleys and stark deserts, in a thin coastal strip between the cold waters of the world's richest fishing grounds and the highest tropical mountains. This region boasts a rich archaeological legacy of pre-Inca civilizations that occupied these valleys from the 1st to the 14th century AD. The most prominent were the Chimu, Moche and Sican, who demonstrated great sophistication in agriculture, ceramics and metallurgy. 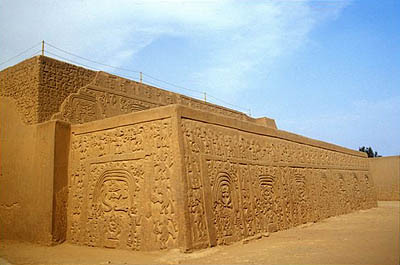 The ruins of these civilizations grace the outskirts of the two principal cities, Trujillo and Chiclayo. Among the important archaeological sites is the sprawling adobe city of Chan Chan, capital of the Chimu Empire. Others include the Moche's frieze-covered Pyramids of the Sun and Moon; Sipan, the world-famous tomb of a Mochica ruler; and Tucume, also known as the Valley of the Twenty-Six Pyramids. Near Tucume are the ruins of the Sican capital, Batan Grande. This archaeological adventure journeys to the monuments of those ancient civilizations. 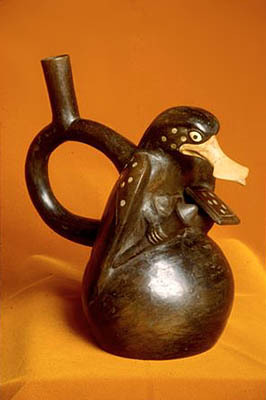 Mochica "orejera" depicting a duck, Royal Tombs of Sipan Museum, Lambayeque. The Chimus' ten adobe citadels of Chan Chan in ancient times dazzled the spectator with temples and palaces adorned with geometric friezes in brilliant hues of color, elaborate ceremonies captured forever on their painted ceramics, and gold masterpieces that later became the treasures of the Incas. The ruins of the Emerald Temple and the restored Rainbow Temple bring to life a vision of the kingdom at the height of that greatness, when it offered fierce resistence to the expansion of the Inca Empire. At Sipan, the Mochica culture, preceding the Incas by a thousand years, gained world attention upon the discovery of the rich and undisturbed royal tomb of "The Lord of Sipan" at the Huaca Rajada. It is the richest tomb discovered in the Americas -- the New World's "King Tut". The gold and silver works show an exquisite artistic sensitivity, heretofore noted in the superb "portrait" ceramics. 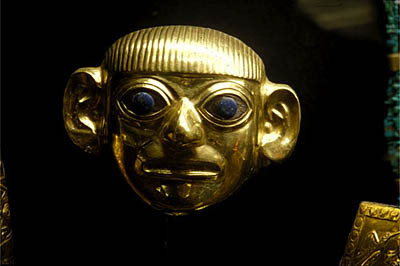 Fine gold artifacts and ceramics from these sites are on display at the Royal Tombs of Sipan and Brüning museums. 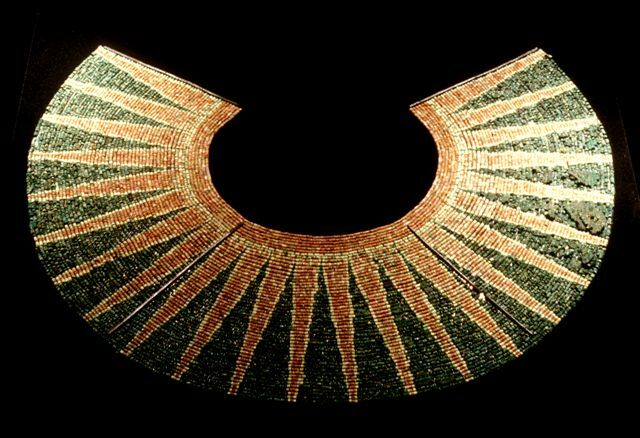 Sipan necklace of Spondylus shell, Royal Tombs of Sipan Museum, Lambayeque. Day 1: Lima - Trujillo. Afteroon transfer to the airport. Flight to Trujillo. Reception and transfer to your hotel. Dinner of regional cuisine at Fiesta Trujillo Gourmet. Overnight in the Hotel Libertador Trujillo -- Suite. Day 2: Pyramids of the Sun & Moon - Colonial Quarter - Chan Chan. Morning excursion to the Pyramids of the Sun and Moon, where archaeologists are uncovering polychrome friezes with mask-like reliefs of mythological beings. See discoveries from the pyramids in the site museum. Return to Trujillo for a walking tour of the colonial city. The exquisite ensemble of colonial structures surrounding the Plaza de Armas is an artistic masterpiece. Enter the Cathedral and the 18th century mansions La Casa Urquiaga and La Casa de la Emancipación. Complete your walk at the historic Plazuela El Recreo, a favorite place of poets and lovers. Drive to Huanchaco, where fishermen still surf in totora-reed boats like their ancestors did thousands of years ago. Typical lunch. Proceed to Chan Chan, where ten adobe citadels are enclosed by a massive adobe wall. Nearby, the restored Huaca El Dragón, also known as the Huaca Arco Iris, will give you an idea of the city's original appearance. Dinner of Peruvian or international cuisine at Chelsea. Overnight in the Hotel Libertador Trujillo -- Suite. Day 3: Trujillo - El Brujo - Hacienda Paijan - San José de Moro - Chiclayo. Morning departure north along the coast to El Brujo archaeological complex, dating back 500 years. The site is composed of three Mochica and pre-Mochica huacas. Huaca Prieta is the oldest on the Peruvian coast and Huaca Cao has magnificent polychrome, high-relief figural friezes, unique among known Mochica artifacts. Typical lunch and an exhibition of Peruvian Paso horses at Hacienda Paijan, a reknowned horse-breeding ranch. At San José de Moro, visit a cemetery dating to the transition between the Mochica and Lambayeque cultures. Arrival in Chiclayo. Dinner and overnight in the Casa Andina Select Chiclayo -- Suite. Day 4: Witch Doctors' Market - Tucume - Royal Tombs of Sipan Museum - Sipan. The Lambayeque Valley, in archaeological terms, is the richest in the northern coast of Peru. Visit Chiclayo's witch doctors' market before a morning excursion to Tucume. Within the 81-acre archaeological complex, rise 26 adobe pyramids, the oldest dating back to 700 AD. 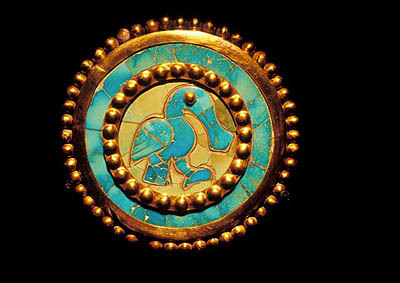 Before visiting the archaeological site of Sipan, view the artifacts unearthed there at the Royal Tombs of Sipan Museum. Lunch at the hotel. Afternoon at the Mochica archaeological complex of Sipan, located in the site called Huaca Rajada. It comprises two pyramids and one platform dating back a thousand years before the Incas, where two of the most famous pre-Columbian tombs were found undisturbed -- the tombs of "The Lord of Sipan" and his ancestor, "The Old Lord". Return to your hotel. Dinner and overnight in the Casa Andina Select Chiclayo -- Suite. Day 5: Batan Grande - Sican Museum - Bruning Museum - Lima. Morning departure to Batan Grande. The Sican culture developed here and, according to archaeologists, was one of Peru's most important metallurgical centers in ancient times, evidence of which is on display in the newly-opened Sican Museum. Typical lunch of regional cuisine at Fiesta Chiclayo Gourmet. Afternoon excursion to the Brüning Museum, noted for its spectacular collection of 1,500 gold, textile and ceramic objects of the regional cultures. Continue to the airport for the flight to Lima. Reception and transfer to your hotel. Dinner at Mesa 18. Overnight in the Orient-Express Miraflores Park -- De Luxe Suite with Ocean View. Day 6: Lima - Your next destination. Early transfer to the airport for the flight to your next destination. Afteroon transfer to the airport for the flight to sunny Trujillo, the "City of Eternal Spring". Arrival, reception and transfer to your hotel. Dinner of regional cuisine by chef Hector Solis at Fiesta Trujillo Gourmet. Overnight in the Hotel Libertador Trujillo -- Suite. Newly uncovered friezes at the Pyramid of the Moon, Trujillo. Breakfast. Long before the Spanish arrived, this coastal strip was the scene for the rise of diverse cultures, among them the pre-ceramic Huaca Prieta civilization of c. 3000 BC and the Cupisnique of c. 1000 BC. The first to extend itself beyond its original river valley was the Mochica culture, c. 1200 AD, for whom this area became their principal seat of government. With a base of agriculture and warfare, the Moches constructed innumerable palaces and temples, called "huacas" (holy places), such as the Huacas del Sol y de la Luna (Pyramids of the Sun and Moon). Morning excursion to the Pyramids of the Sun and Moon in the fertile Moche Valley, where archaeologists are uncovering polychrome friezes with mask-like reliefs of mythological beings. Built of millions of adobe blocks, the pyramids are the largest pre-Columbian structures in South America. See discoveries from the pyramids in the site museum. 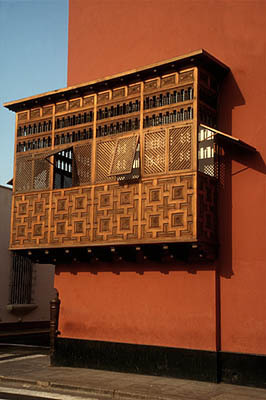 Casa Mayorazgo de Facalá, Trujillo. Return to Trujillo for a walking tour of the colonial city, founded in 1534 by Diego de Almagro, Francisco Pizarro's one-time partner in the conquest of Peru. Taking its name from the city in Spain where Pizarro was born, Trujillo is notable for the Renaissance style of its urban plan and its colonial and republican-era architecture, expressed in its churches and mansions. 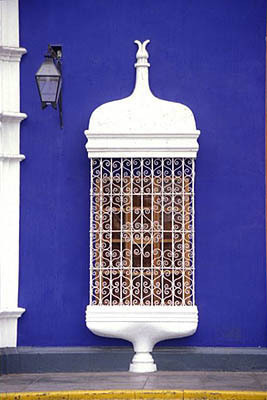 The exquisite ensemble of colonial structures surrounding the Plaza de Armas, such as the 18th century La Casa Bracamonte, La Casa Orbegoso, La Casa Mayorazgo and El Templo de la Compañia de Jesús (begun in 1632), is an artistic masterpiece. Their joyous architecture creates an unparalleled impression of the city's glory under the Spanish kings, three to five centuries ago. Enter the Cathedral (begun in 1647) and the 18th century mansions La Casa Urquiaga, which housed Simon Bolivar during the War of Independence, and La Casa de la Emancipación, where the Marquis of Torre Tagle proclaimed the city's independence from Spain in 1820. Complete your walk in the shade of the ancient trees at the historic Plazuela El Recreo, a favorite place of poets and lovers. 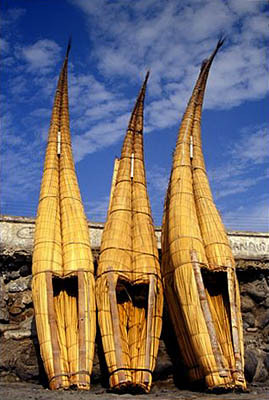 Caballitos (traditional tortora-reed boats) at Huanchaco, Trujillo. Drive to Huanchaco, an immaculate sand beach where fishermen still surf in totora-reed boats like their ancestors did thousands of years ago. Typical lunch. After the Mochica, the Chimu culture emerged, whose capital of Chan Chan, the largest pre-Hispanic city in Peru, housed at its zenith more than 60,000 inhabitants and whose kingdom offered fierce resistence to the expansion of the Inca Empire. 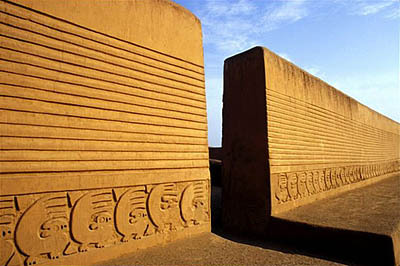 Proceed to Chan Chan, located near the ocean, where ten adobe citadels are enclosed by a massive adobe wall. Nearby, the restored Huaca El Dragón, also known as the Huaca Arco Iris (Rainbow Temple), will give you an idea of the city's original appearance, when its high-relief friezes were painted in vivid colors and glowed brightly in the equatorial sun. Depictions of sea life and fishing activities reveal their importance in the life of the Chimu. Dinner of Peruvian or international cuisine at Chelsea. Overnight in the Hotel Libertador Trujillo -- Suite. Frieze of El Dragón, Trujillo. Breakfast. Morning departure north along the coast to El Brujo archaeological complex, dating back 500 years and one of the best-preserved sites in the area. The name comes from the fact that the site was used by the local "brujos" (shamen) -- and even to this day, the region's reknowned shamen use natural cures and invoke the ghosts of their ancestors to treat illness and ward off evil spirits. The site is composed of three Mochica and pre-Mochica huacas and many minor mounds. 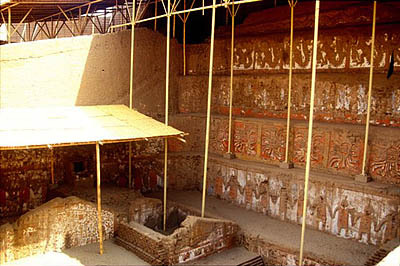 Huaca Prieta is the oldest on the Peruvian coast and Huaca Cao has magnificent polychrome, high-relief figural friezes, unique among known Mochica artifacts. Typical lunch and an exhibition of Peruvian Paso horses at Hacienda Paijan, a reknowned horse-breeding ranch. At San José de Moro, visit a cemetery dating to the transition between the Mochica and Lambayeque cultures. Arrival in Chiclayo. Dinner and overnight in the Casa Andina Select Chiclayo -- Suite. 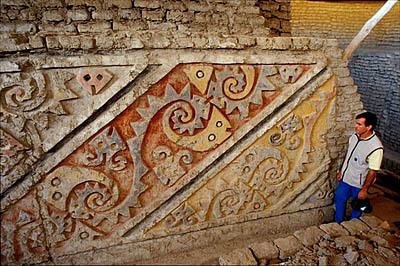 Polychrome, high-relief frieze, Huaca Cao, El Brujo, Trujillo. Breakfast. The Lambayeque Valley, in archaeological terms, is the richest in the northern coast of Peru. It is a fertile agricultural region that for the past two millennia has been the nucleus of ancient pre-Columbian cultures, notably the Mochica, which built important temples, such as Huaca Rajada, the pyramids of Tucume, Batan Grande and others of world-wide importance. Visit Chiclayo's witch doctors' market before a morning excursion to Tucume. Within the 81-acre Tucume archaeological complex, rise 26 adobe pyramids, the oldest dating back to 700 AD. One of the most awe-inspiring is similar in volume to the great Egyptian pyramids. The archaeology reveals that the valley was occupied by the Moches in a very early stage, developing a complex culture based in maritime trade, fishing and agriculture. The late stages reveal an ample contact of this valley with the Chimu kingdom of Chan Chan, located about 200 miles south. 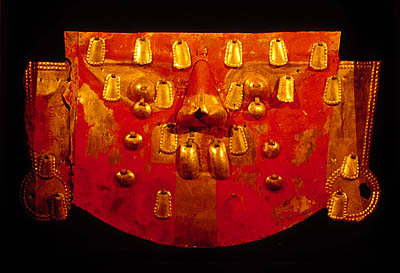 Sipan mask, Royal Tombs of Sipan Museum, Lambayeque. Before visiting the archaeological site of Sipan, view the artifacts unearthed there and now exhibited at the Royal Tombs of Sipan Museum. With an architecture inspired by the Moche's pyramids, subdued lighting and traditional music played on pre-Hispanic instruments, the museum creates a meditative mood for contemplating the past as revealed by the richest collection ever discovered in Peru. Lunch at the hotel. Afternoon at the Mochica archaeological complex of Sipan, located in the site called Huaca Rajada. It comprises two pyramids and one platform dating back a thousand years before the Incas, where two of the most famous pre-Columbian tombs were found undisturbed by Peruvian archaeologist Dr. Walter Alva in 1987 and 1988 -- the tombs of "The Lord of Sipan" and his ancestor, "The Old Lord". They ruled the valley's fate during the second and third centuries AD. The treasure of pure gold artifacts discovered in the tombs revealed their culture's surprising command of metallurgy and its exquisite artistry in gold and silver, in addition to its known excellence in ceramics. Return to your hotel. Dinner and overnight in the Casa Andina Select Chiclayo -- Suite. 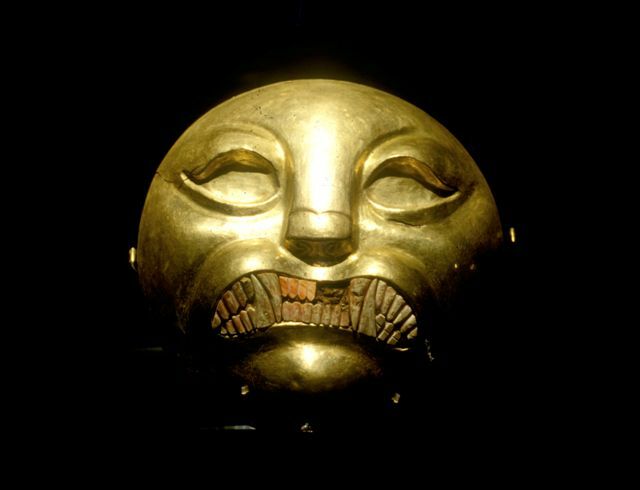 Sican gold mask, Sican Museum, Lambayeque. Breakfast. Morning departure to Batan Grande, an archaeological and ecological reserve. The Sican culture developed here and, according to archaeologists, was one of Peru's most important metallurgical centers in ancient times, evidence of which is on display in the newly-opened Sican Museum. Among the 20 pre-Inca structures, Las Ventanas is famous for the discovery of a large golden "tumi", or sacrificial knife. The site is fascinating in that the ruins are within a carob tree forest, believed to be the largest in Peru. Typical lunch of regional cuisine by chef Hector Solis at Fiesta Chiclayo Gourmet. Afternoon excursion to the Brüning Museum, in Lambayeque, noted for its spectacular collection of 1,500 gold, textile and ceramic objects of the regional cultures. Continue to the airport for the flight to Lima. Reception and transfer to your hotel. Dinner of vanguard cuisine by resident chef Diego Muñoz at Mesa 18. Overnight in the Orient-Express Miraflores Park -- De Luxe Suite with Ocean View. Sipan mask of a feline face, Royal Tombs of Sipan Museum, Lambayeque. Breakfast. Early transfer to the airport for the flight to your next destination.